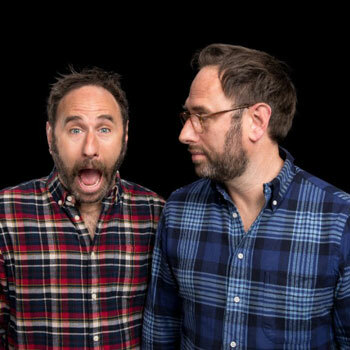 Home » Moontower Comedy » Schedule » The Sklar Brothers present Tag It! Get to see the inner workings of how comedy bits get punched up and tagged by fellow comedians as The Sklar Brothers bring their incredible wit and insight to their funny friends’ bits. The Sklars invite their hilarious guests to do a standup set and then pitch them “tags” and jokes for the bits they just saw. It’s what happens in green rooms around the world as comics come off stage and you get to see that process unfold in Real Time on stage. It’s riffstastic fun as The Sklar Brothers pull back the curtain on standup bits in a totally new and unique way. Respect the process as the Sklar Brothers and Friends TAG IT!